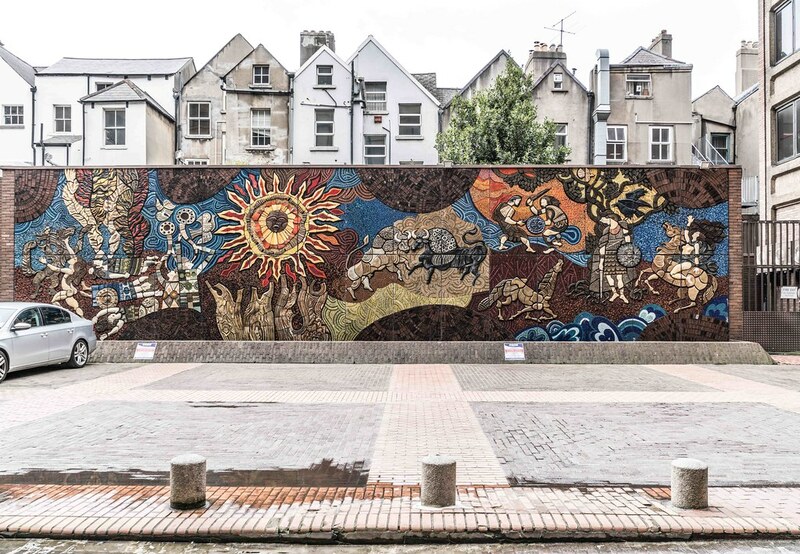 Desmond Kinney’s 1974 mosaic mural off Nassau Street in Dublin also goes by the name of the Táin Wall. It is possible that the majority of Dubliners are unaware of this mural and at the site there is nothing to indicate what it is or even the identity of the artist. Desmond Kinney was born in Portstewart in 1934 and attended the Belfast College of Art along with Basil Balckshaw, TP Flanagan and Cherith McKinstry. In the 1960s he established Kinney/ Dobson, one of the first graphics agencies in Belfast, which went on to achieve international recognition. From the 1970s onwards, he specialized in large-scale murals, exhibiting widely in Belfast, Dublin, London and the USA. Working from his family-based studio, Kinney Designs in Belfast, he produced more than 30 glass mosaics, many based on Irish legends. 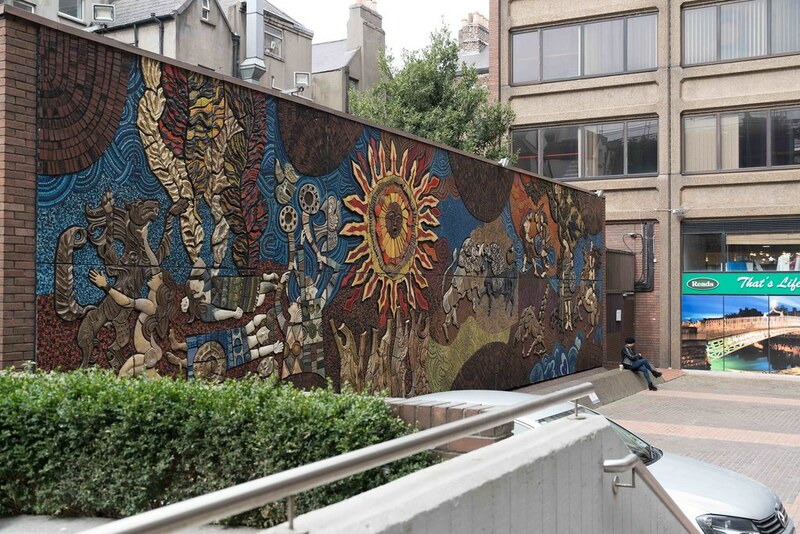 Well-known pieces include the Setanta Wall (1974) off Nassau Street, Dublin, which features stories about the mythological hero Cúchulainn, and ‘Sweeney Astray’, also in Dublin, based on the 1983 poem by Seamus Heaney. Possibly his best-known mural in Northern Ireland is the huge mosaic situated at the main entrance to the piazza of Derry~Londonderry’s Millennium Forum Theatre. This tessellated Venetian glass mosaic, dating from 2002, depicts the legend of Midir and Etain, one of the most romantic stories in Irish Literature and a fittingly resonant work to mark the theatre space. Desmond Kinney’s funeral service took place at Roselawn Crematorium in Belfast on 13th September, 2014.